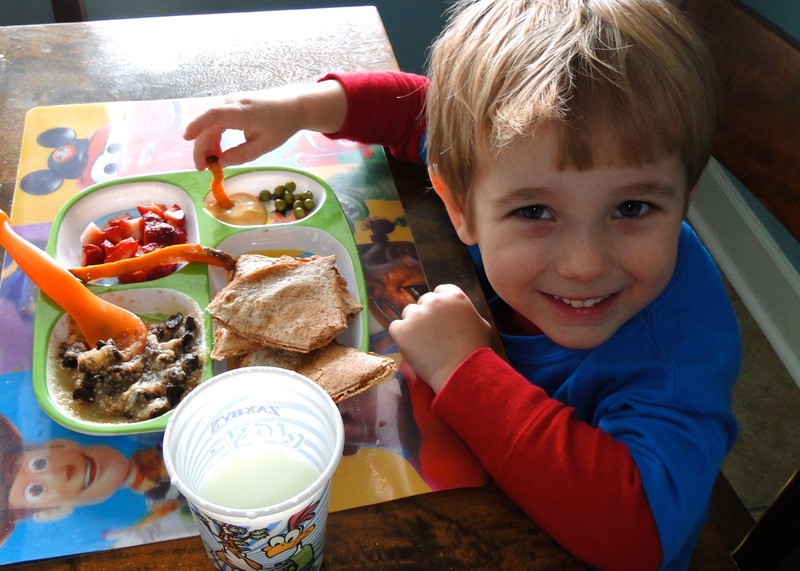 I have always tried to feed my kids rather healthy. No, we don’t do all organic. No, I don’t have a garden at home. No, I don’t feed them a “clean eating” type diet. But I do my personal best. I buy organic when possible (we do all organic milk for sure). I try to feed them colorful foods at each meal. I limit sweets and processed foods as much as I can. We mostly eat all of our meals at home and I try to offer a variety of things at each meal. Kye is turning four this coming week and has EVER only had plain white milk, water, or juice (our version of juice is v8 fushion mixed with naked juice green machine and water) and an occasional cup of lemonade or some other party punch or juice box and hot cocoa like three times ever. No chocolate milk, no sweet tea, never even one single sip of soda. While I do GREAT at limiting the junk he eats, I don’t do as well with getting him TO eat the healthy stuff. It’s much easier to keep a child FROM something than it is to get him TO EAT something haha! This especially slacked once Britt was born. Having two kids ain’t no joke and I just kinda went into survival mode. Breakfast and dinner stayed healthy but that lunch time meal became what was EASY. PB&J like every single day. Fruit as a side and no veggie. I didn’t wanna deal with the hassle of a vegetable that I was having to “make” him eat. So I didn’t bother and just saved them for dinner. I’m SO thankful for the “veggie drinks” as we call them…those squeezable baby food things? They are LEGIT. Organic vegetables (2 servings worth per packet!) and Kye LOVES them. His favorite ones are actually the spinach so I have just always loaded him up with those and felt okay about his diet. Now that Britt is completely eating regular foods and my life is EASIER (seriously…after that baby turns 1 life is just SO MUCH better haha!) I decided to start focusing on lunch time. I was tired of the battle over the vegetables. Tired of going the easy, quick route instead of the healthy route. It was time for a change! Breakfast and dinner have been healthy and have remained healthy! I have tried to re-think breakfast but seriously my kids eat the same thing every morning and I can’t think of anything that would offer them a better start to their day than this? They get milk, vitamins (Kye eats the NEW Advocare V100 Tropical Chews and LOVES them. SO much healthier than the Flinstone vitamins he used to get! and I put a liquid dose of a multi vitamin for babies in Britt’s morning milk), fresh banana (or frozen banana if we’re out of the fresh ones), handful of multigrain cheerios and prunes (Kye gets two, Britt gets one). I mean I figure the prunes help ’em “go” and the banana will keep ’em from “going” too much…right? I just love that breakfast and Kye has literally eaten it every morning for like three years haha! I went on a search for lunch ideas and found a few on Pinterest (I have created a board for lunch ideas as I come across them…you can check it out HERE!) I also just SAT and THOUGHT about it. I think I came up with majority of the things I made on my own…just by sitting and thinking. It’s amazing what you can come up with when you just take the time to THINK of things haha! Here is what I made each day and how he liked it! 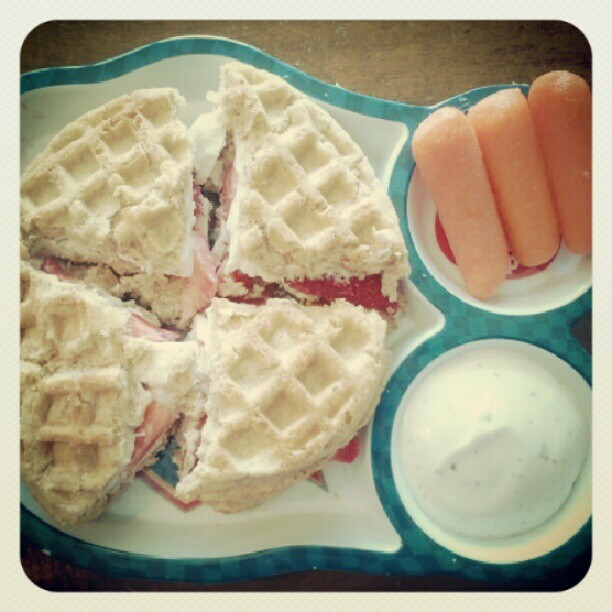 Day 1: Two whole wheat frozen waffles, toasted with cream cheese spread and fresh strawberries. Carrot sticks with ranch dressing for dipping. I also prepared applesauce which is not pictured here (but is below of the one where he is eating). The applesauce I used was unsweetened. I added a dash of cinnamon, wheat germ, and raisins to it. 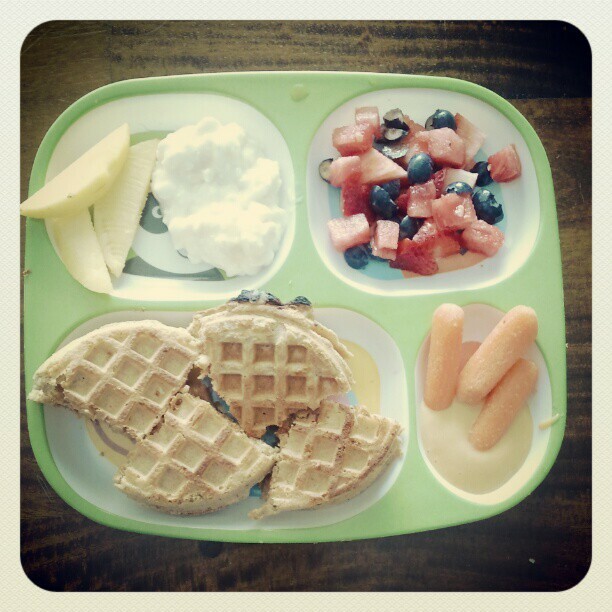 Result: LOVED the waffles! He thought it was so fun! The applesauce was a HUGE hit for both kids…I will always make them applesauce this way from now on. He loved the strawberries in the waffle sandwich but didn’t like the “cream.” He also was not a fan of the ranch dressing. I have never really given him ANY condiments and I had read that Ranch was a kid favorite. Guess not for my kid! I tried ketchup and he enjoyed dipping his carrot sticks and ate them without any “forcing” from me 🙂 Britt LOVES carrot sticks so she munched on them happily. I didn’t make her a sandwich with the waffles…she just got a waffle with the cream cheese and some sliced strawberries on the side. Day 2: Day 1 went so well that I got a little more creative on day two! This time I toasted a thin whole wheat bagel and put peanut butter and honey on it (I gave half to Kye and left half honey free and gave it to Britt). I made him a salad with shredded cheese and a honey mustard type dressing. 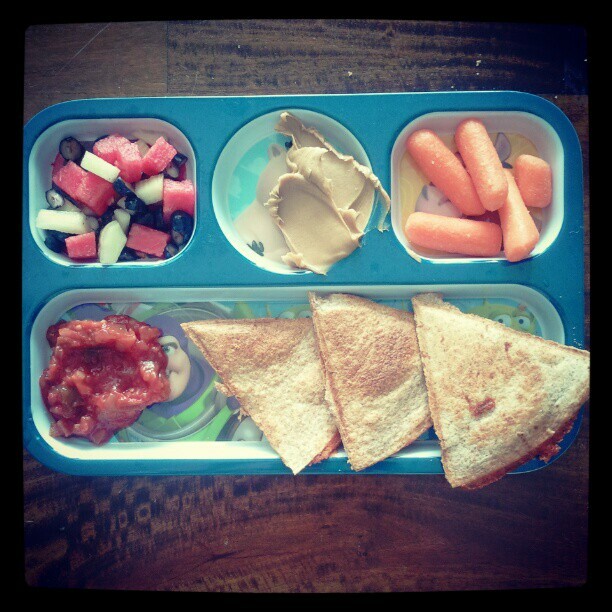 Strawberry yogurt with fresh strawberry chunks, carrot sticks with hummus this time for dipping and a few apple slices. Result: LOVED the bagel sandwich! Loved the yogurt and the apple slices. NOT a fan of the hummus (Britt, however, LOVED the hummus). He liked the salad but not the dressing so he ate the pieces that didn’t have it on them. 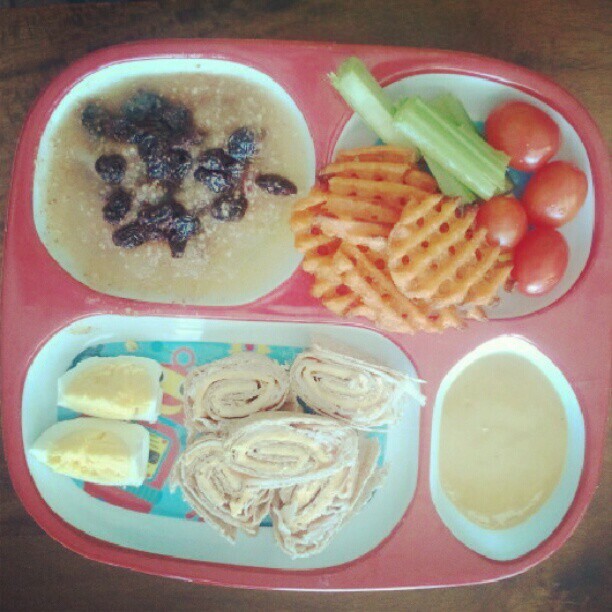 I traded out the hummus for honey mustard dipping sauce and he ate up the carrots with no issues! Day 3: I went the waffle route again as Kye did NOT stop talking about them 😉 This time I did peanut butter and banana slices as the sandwich filler. I also did sliced pears with cottage cheese for dipping. Fresh fruit medley with melon and blueberries and carrot sticks with honey mustard dipping sauce. Can you tell one of my main goals for this experiment was to get him eating carrots? haha! I serve a green veggie at dinner each night so I wasn’t as focused on that! Result: No “result” picture but he loved EVERY SINGLE THING! YAY!!! The honey mustard dipping sauce has been a game changer for us. He literally will eat anything, without complaining, with the dipping sauce 😉 He loves it! He loved the peanut butter in the bagel and ate all the cottage cheese up which surprised me. Dipping def helps 🙂 He ate everything off his plate and I never once had to ask him to try any of it! Score! Britt enjoyed everything equally as well 🙂 No dipping sauce for her though of course! Day 4: I used a whole wheat tortilla and wrapped up lunch meat and cheese in it and made little pinwheels (for Britt I just tore it all up into pieces, presentation is lost on a 1 year old!). I also gave him two sections of a hardboiled egg, the applesauce mix I’d made earlier in the week, and this time I tried something different with the veggies. He LOVES Chick-fil-a fries and I saw these sweet potato ones at the store that were the same “waffle fry” that CFA has…I heated some of those up along with some celery sticks and cheery tomatoes with the dipping sauce. Result: He LOVED the fries 🙂 Woohoo! He also enjoyed the little pinwheels and the eggs. I knew the applesauce was an easy win! The celery and tomatoes were a no go though. Britt didn’t seem to care for the celery either anymore? She used to like it! He really truly WANTED to like the tomatoes. His Mighty Machines movie has them on it and he was eager to try them but he said the “juice squirting out” was so icky. I don’t blame him…because I agree haha! Day 5: Whole wheat tortilla quesadilla with refried beans and cheese as a filler and mild salsa for dipping. Fresh fruit blend of blueberries and melon. Carrot sticks with peanut butter for dipping. Britt had all the same stuff too! I just tore her quesadilla into pieces for her to eat without choking on it! Result: Salsa was too “slicey” as Kye says (which means “spicy”). He also ended up eating all the peanut butter without using the carrots and asked for the honey mustard sauce for them…so I guess peanut butter isn’t a good dipper for that 😉 He enjoyed the quesadilla though! Britt also wasn’t a salsa fan but liked everything else! 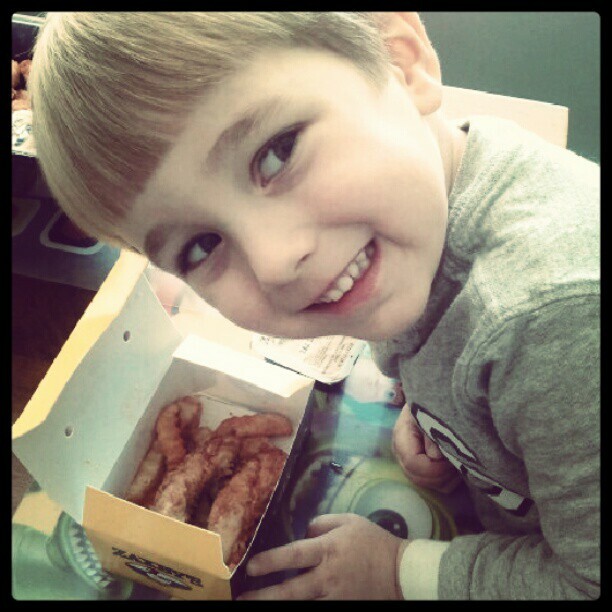 Day 7: After 6 days of eating SO healthy at all three meals…we got a treat and splurged on some Zaxby’s. And yes, we all loved it (and I did make Britt something else as I don’t do fast food often for Kye…and don’t give it to Britt at all yet). I was pretty impressed with how well my little experiment went! It was all SO easy and SO fun to get creative and think up new things! I don’t do any adorable looking food where the sandwiches look like happy faces and stuff…I keep it simple but it makes it EASY! I wrote myself a list of ideas for lunches for Kye. Here’s my list! I also want to add that I think it’s important to be honest with my children so even though he does eat sweets and such on occasion we talk about how those aren’t healthy choices. I’ve explained to him that God commands us to take care of our bodies because He made them especially for us and that God also commands me, as Kye’s Mommy, to feed Kye healthy things. We talk about how the healthy foods we eat help us grow, make us strong, keep us from getting sick, etc etc. It’s nice that even when I have to remind him to eat something on his place that he understands WHY I’m telling him to eat it. It’s not because Mommy is some mean person, it’s b/c Mommy loves him and wants him to be healthy 🙂 He also LOVES pointing out when we eat things that are “bad” for us. If we seasoning something with salt Kye will say “Mommy, that is BAD for you!” One day I was putting on his movie for movie time and the tv had some guys drinking soda and he said “Mommy, Those men are making BAD choices because they are drinking that stuff!” I love his innocence and wish that poor eating choices was the worst choice people in the world made! What do YOU feed your toddler or preschooler for lunch? I’d love to have some other ideas to add to my lists!!! Next Post Kye’s Birthday Slideshow! 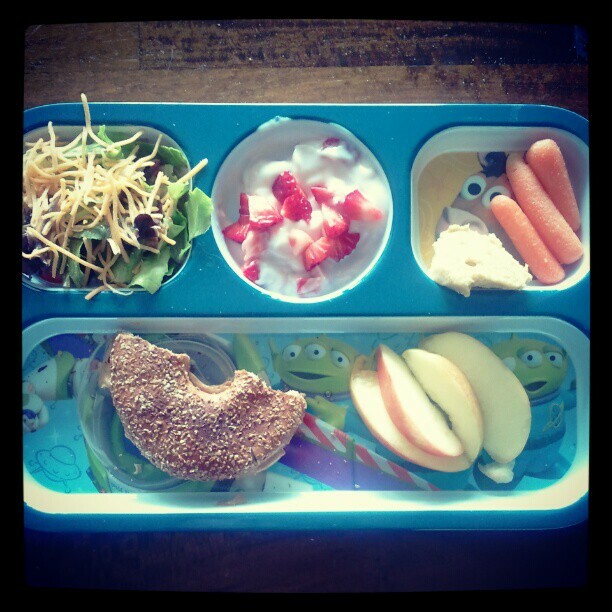 These lunches look a LOT like our lunches! 🙂 I do meatloaf with veggies mixed in for dinner and usually get two more lunches out of that. We only do organic dairy products and most fruits and veggies…I also make a breakfast casserole once a week and put loud of veggies on that and have it for breakfast like 4 days out of the week. The girls LOVE that- and it starts their day with veggies, so I am happy! 🙂 great post!! I have a 2.5 year old boy and a 3 month little girl, and I have been struggling a little bit with his lunches too and variety with them. So thank you for this post! Love the ideas! Oh, since you asked for ideas, lately we have been doing green smoothies for lunch. Several cups of spinach, an apple, half a banana, 3/4 cup orange juice, 1/4 cup milk, handful of ice cubes, and a pinch of sugar or honey if you want. Then mix it in the blender. You don't even taste the spinach, and my 2 year old likes it as much as I do! I'm sure you could add supplements or other ingredients (like strawberries or blueberries) too. Thank you this gave me so many new ideas! We are in a pbj rut!